It must be stressed that when one scores a reservation to LudoBites, practically every dish is essential. 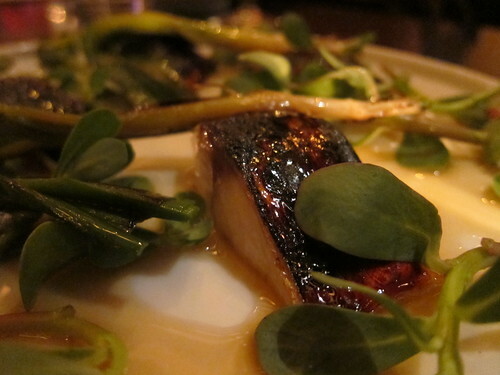 But that’s not to take away from my having been especiallyÂ inspired byÂ Ludo’s mackerel. The sugar glaze on the skin of the salty fish is ingenius, actually. Add to that the lush but sturdy leaves of verdolagas – with its slightly acidic taste matching a note of the true flavors of the mackerel – and you have a masterpiece. The baby leeksÂ add a subtle kick to things and “tiger’s milk” – plus whatever unbeknownst oils that lay at the base of the plate – will have you sopping whatever pools that lay with the provided green petals. And that is just one LudoBites memory I choose to share with you all.Â I hope you got a reservation. Apologies if not. Check OpenTable regularly and be sure to follow KrissyÂ (@frenchchefwife) for cancellations. Per the website: “Â Typically cancellations come in during the morning after reminders have been sent out, so best time to check for availability on a given day is that morning.” Good luck.